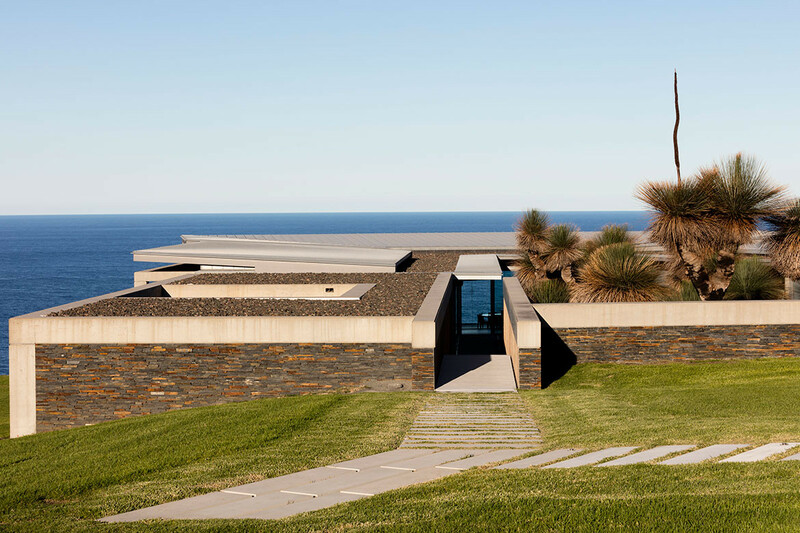 Architects Philip Thalis and Laura Harding frequently use the word ‘epic’ when they talk about this house, located on the coast south of Sydney. It was – and is – an epic journey. For a start, the project commenced in 2001, but a complex approval process delayed construction until 2008. 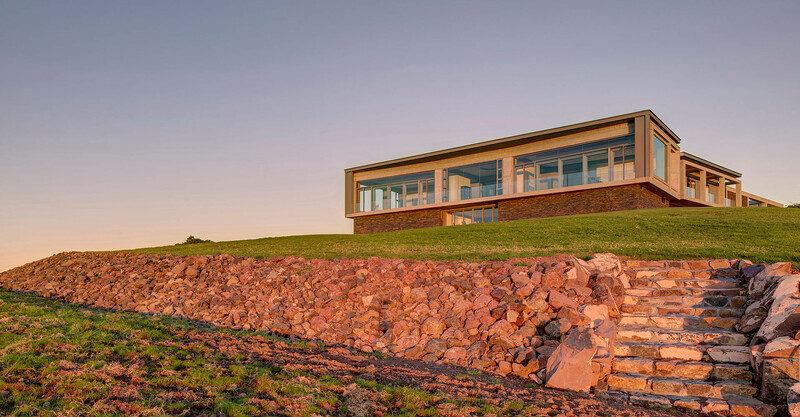 Then the client was unable to continue and the house remained as a “landscape ruin” until it was onsold in 2015. 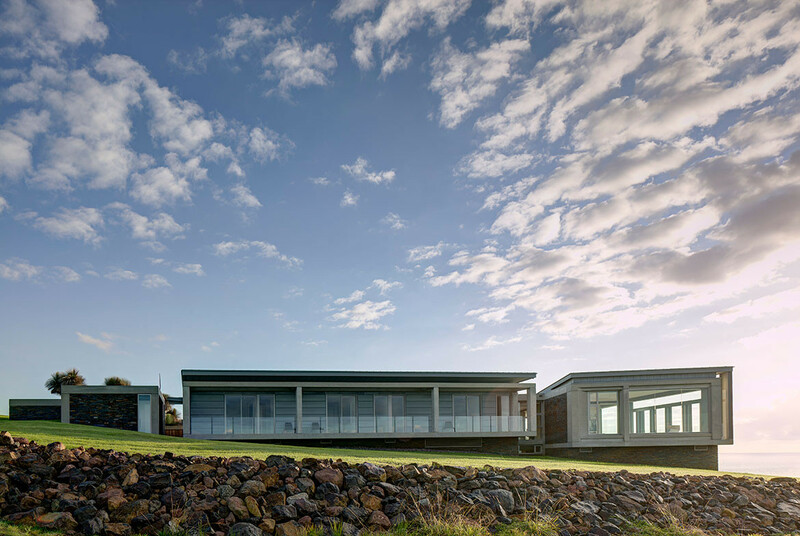 The new owners, however, approached Hill Thalis Architecture + Urban Projects to complete the building with a new builder, changing the purpose of the building from a holiday home to a permanent residence. 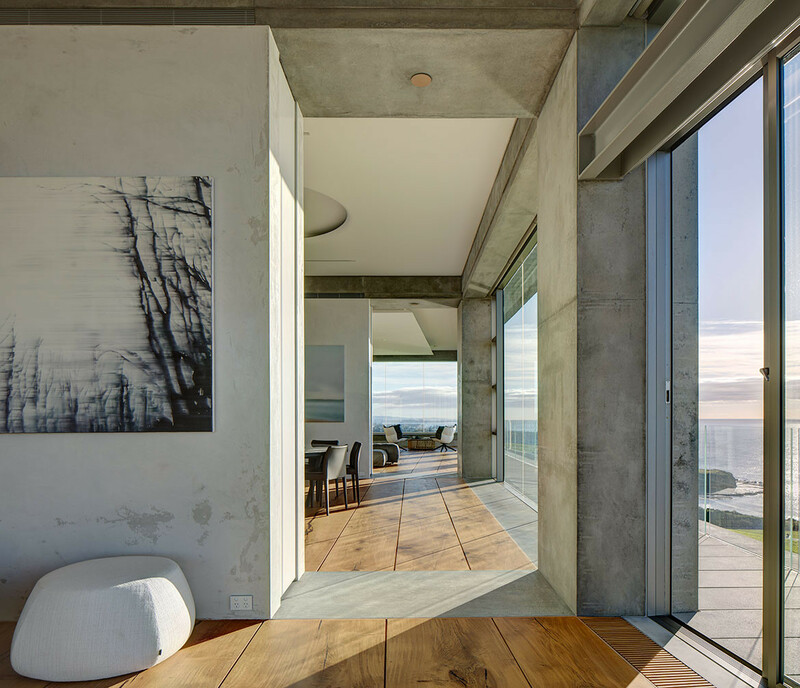 But the house is epic also in terms of its site and the way it engages with site, showcasing splendid views north and south of the the Pacific Ocean and a view eastwards through which you can see the curvature of the earth. 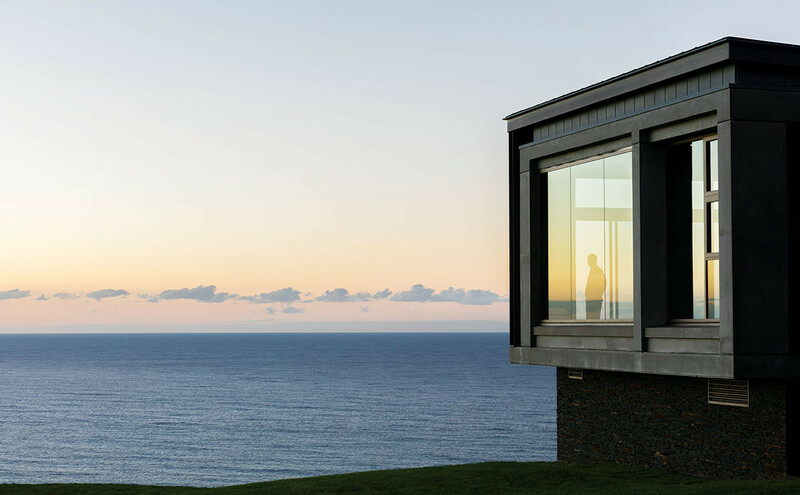 “You just don’t want to put an ordinary house there,” says Philip Thalis. It sits on the ridge of a spur thrusting out towards the ocean. It is very exposed and very windy. 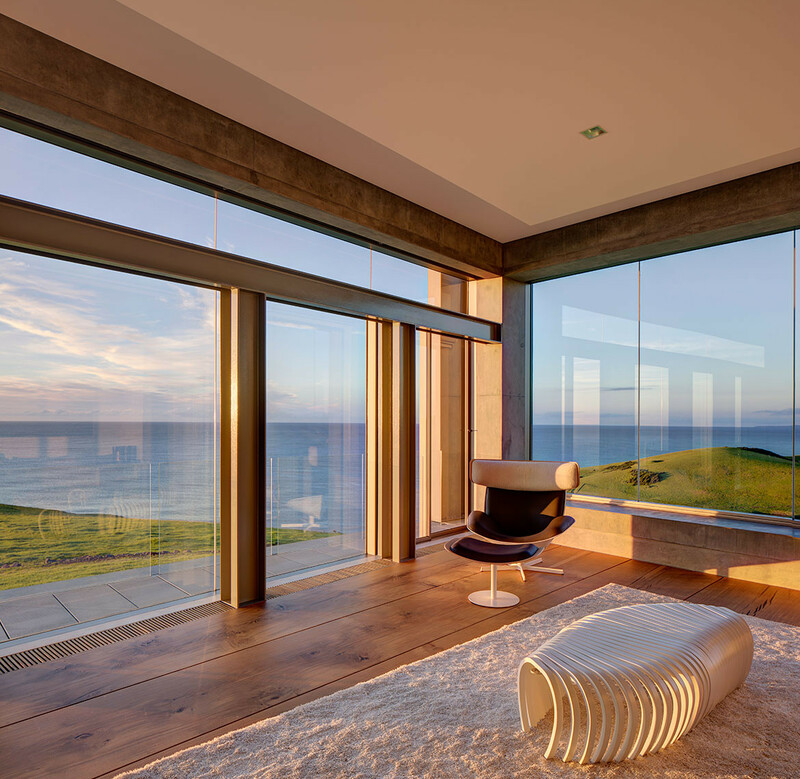 The planning is based on two intersecting axes – one effectively responding to the coastline, the other out towards the horizon. 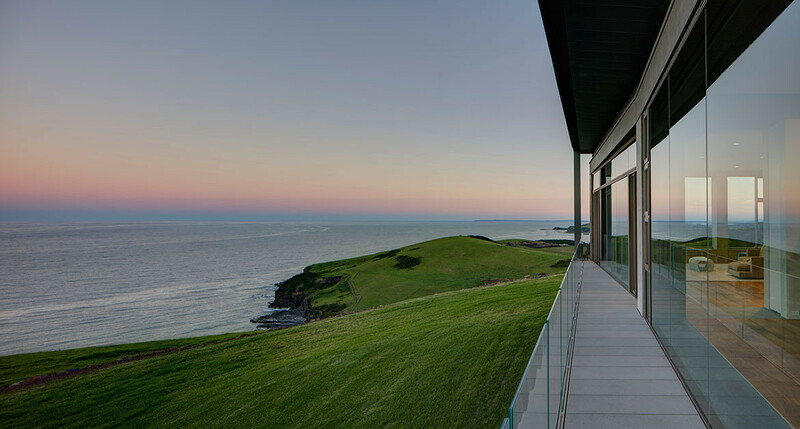 Hence, on approach down a slope, the roofline anticipates the line of the horizon and, thereafter, it is a journey towards said horizon and the water. 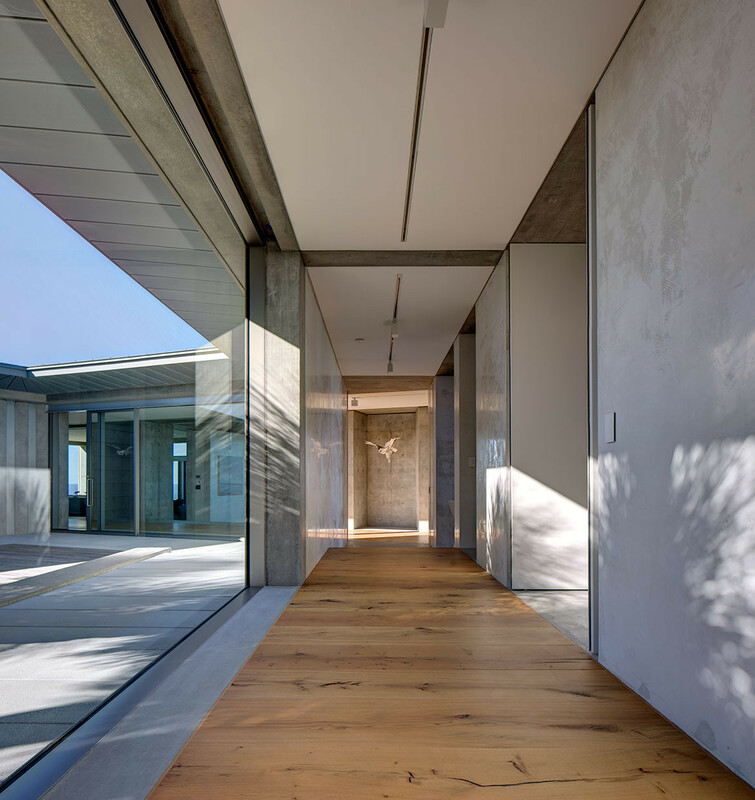 On entry, one journeys through a tapered courtyard cut into the earth with tantalising glimpses of the ocean spectacle to come. 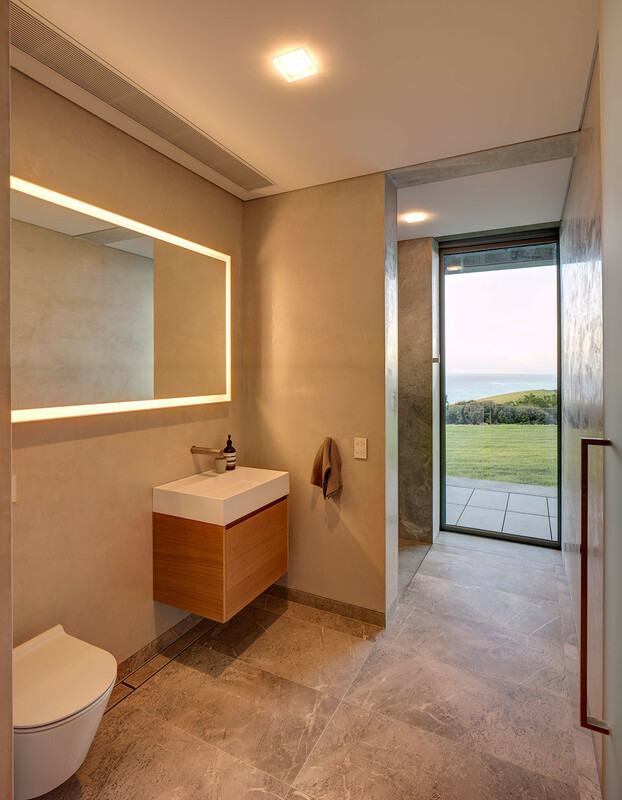 This entry sequence leads ultimately to a “grand suite of rooms”, or three connected spaces 25 metres wide which comprise the living/dining/kitchen wing with their panoramic views out over the ocean. “Everything is foreshortened,” says Laura Harding, “until you come into the front wing when everything explodes.” But before then it is like looking down a telescope with a gathering sense of excitement until the full majesty of the ocean is revealed. 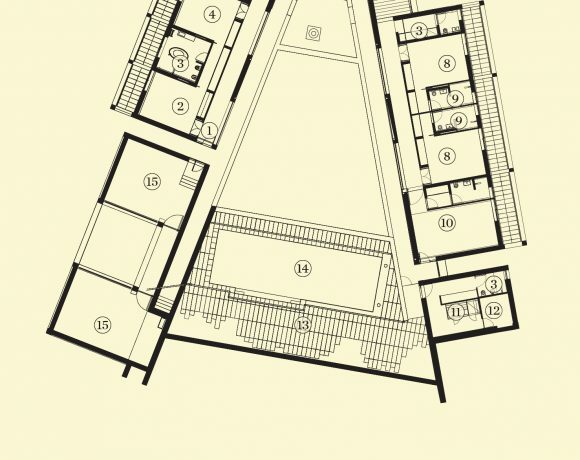 The house itself is not especially large, nor is it particularly elevated with a height restriction of six metres. In fact, the aim was to create a sense of domestic security. “We think that privacy, enclosure and a sense of protection is quite important,” says Philip. 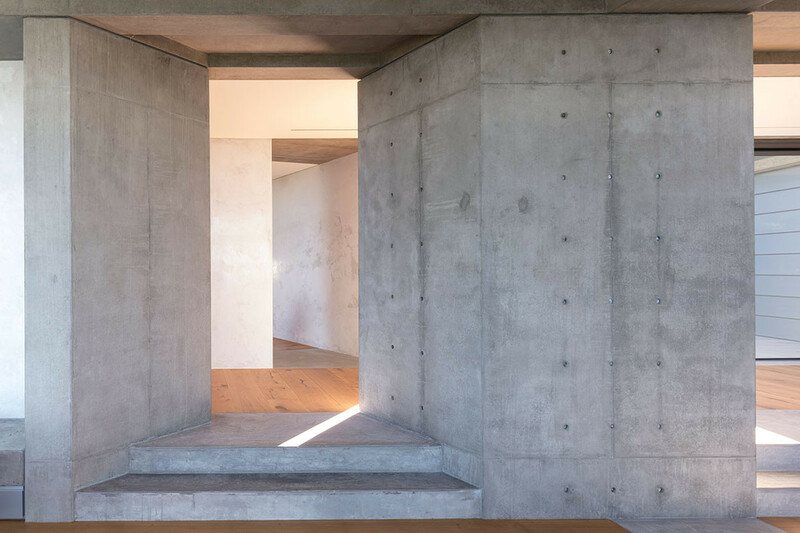 “It’s a house you’re within, but you experience the changing landscape.” Accordingly, the bedrooms are equal wall and window. 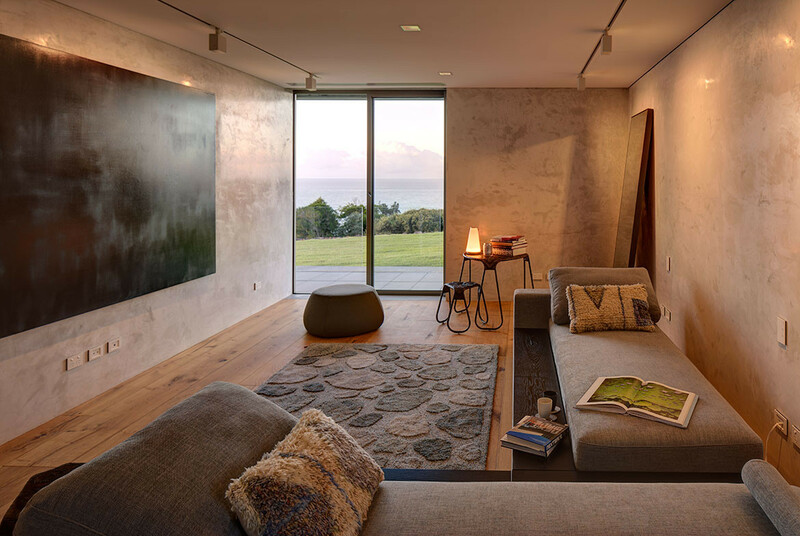 The side bedroom wings – north for the owners, south for guests – don’t look out to the ocean, but to the rural landscape and inwards to the courtyard. 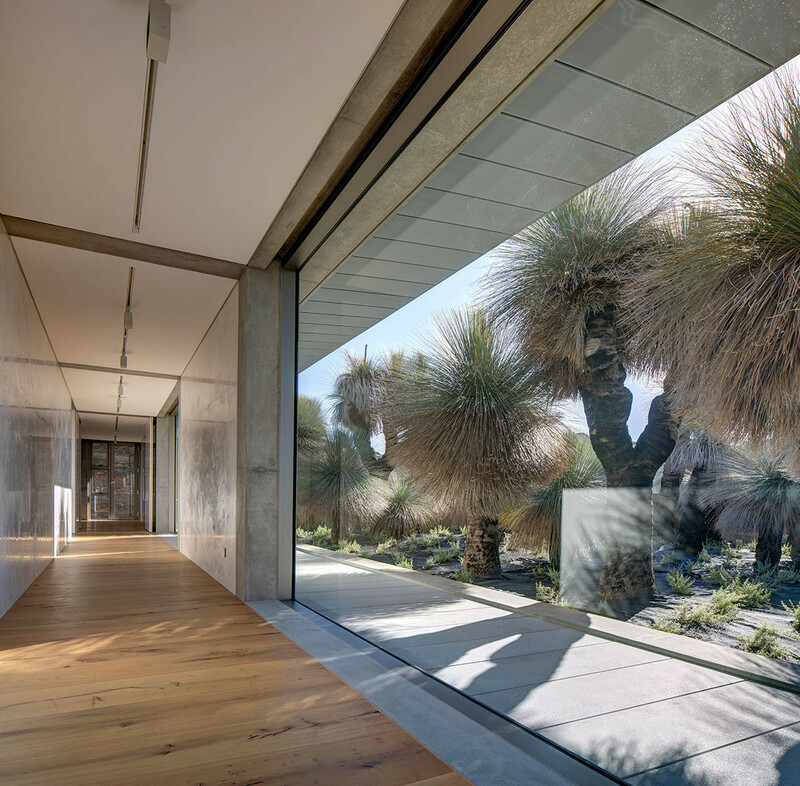 The courtyard itself is protected and populated by aged grass trees – “looking like Jurassic Park,” says Laura – its tapered form defined at the western end by a swimming pool and glimpsed views of the ocean through the living/dining space at the eastern end. 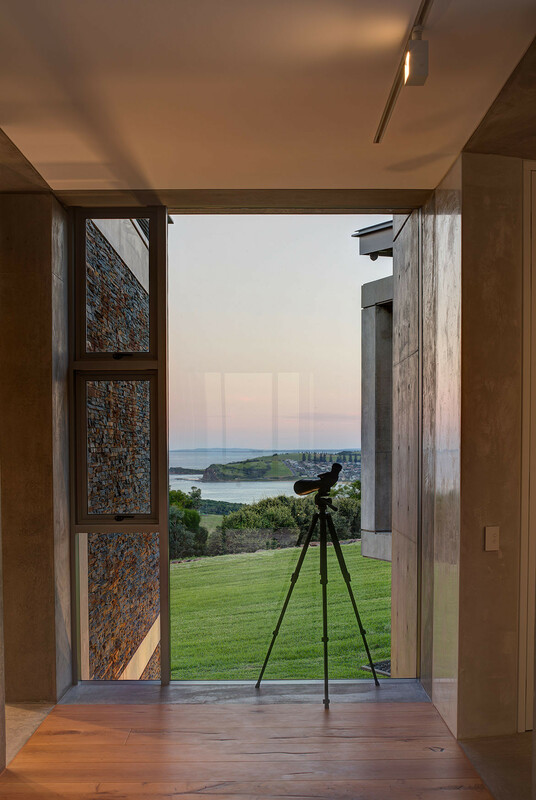 The effect is a striking contrast between the still, cultivated and enclosed character of the courtyard and the wild, seemingly limitless rural and marine vistas. 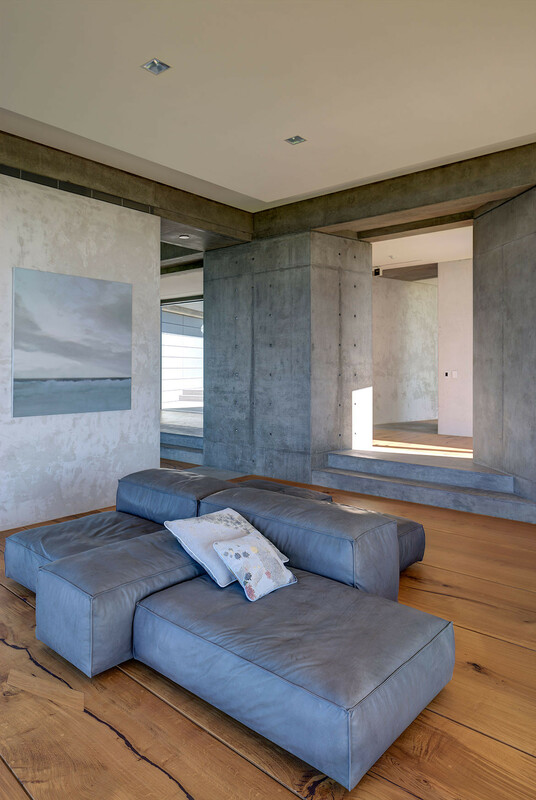 The interior has a powerful haptic quality which begins with the ‘epic’ scale of the off-form, polished concrete frames tempered by a restrained palette of grey, white and silver – itself complementing the vivid blues and greens outside the house. As a further contrast, the oak floorboards (kept in the basement for ten years and measuring up to one metre wide and 10 metres long) resonate against full-sized marble slabs which trim the floors, walls and joinery panels of the eastern wing. 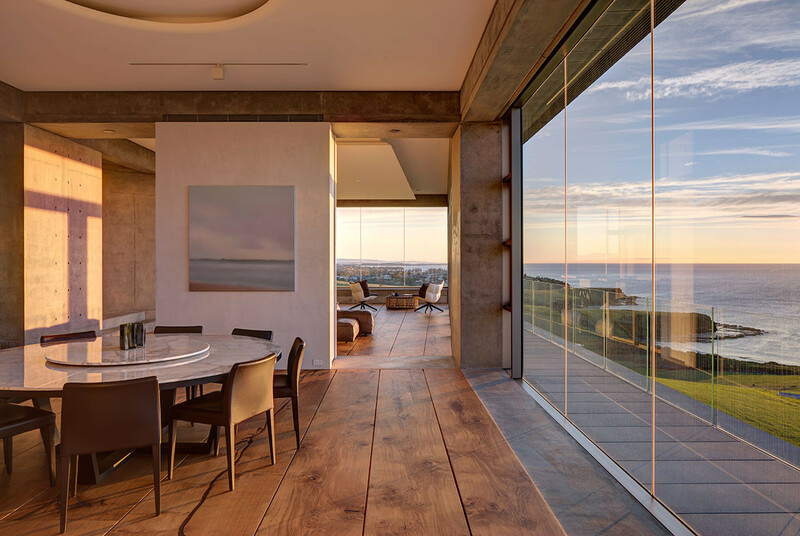 Just as epic is the all-glass kitchen imported from Italy by the food-loving owners. It can be opened and closed and creates, says Laura, “a fascinating reflectivity and theatricality”. 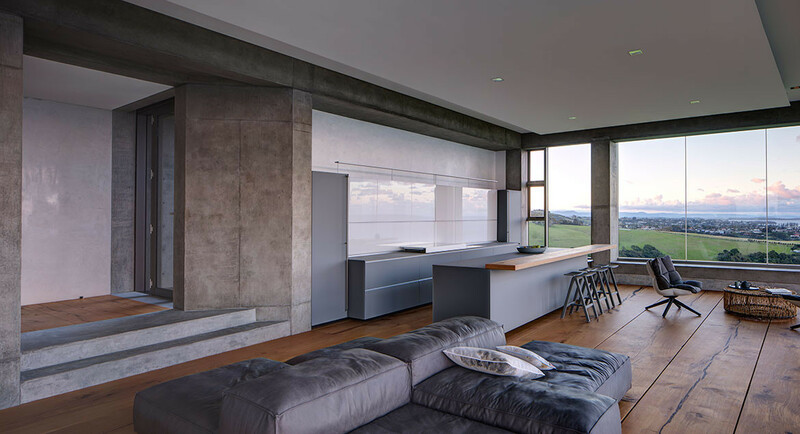 Off-form concrete. Recycled antique oak flooring sourced by Graham Cornall Antiques. 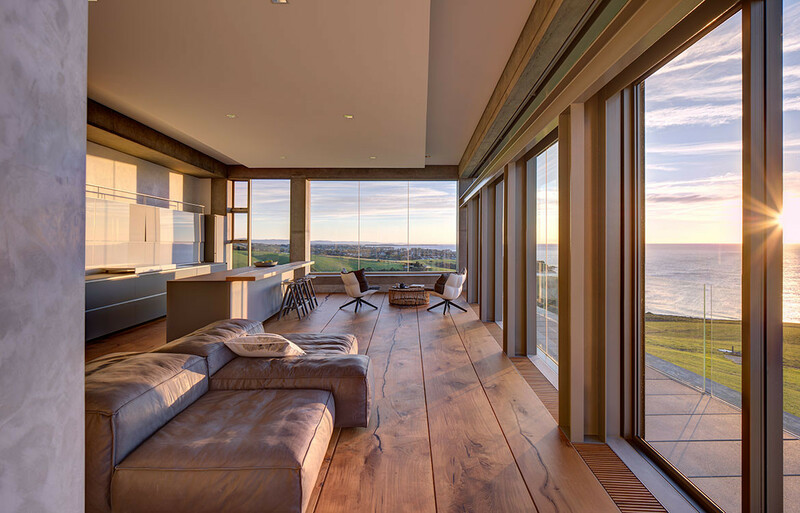 Contemporary engineered oak flooring by Eurostyle floors. Craft Metals/ARC Rheinzink. 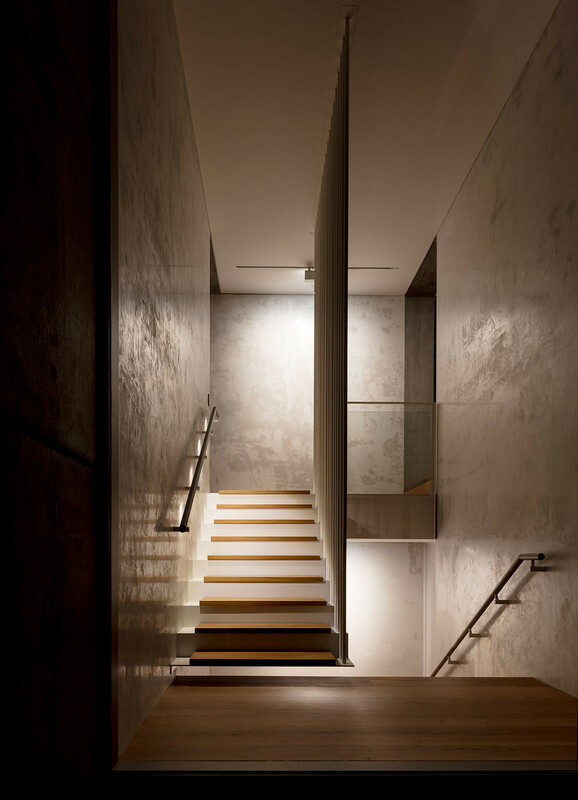 Proyalbi polished plaster. Grigio argento honed marble and Maximum porcelain panels from Artedomus. Spinnybeck leather. 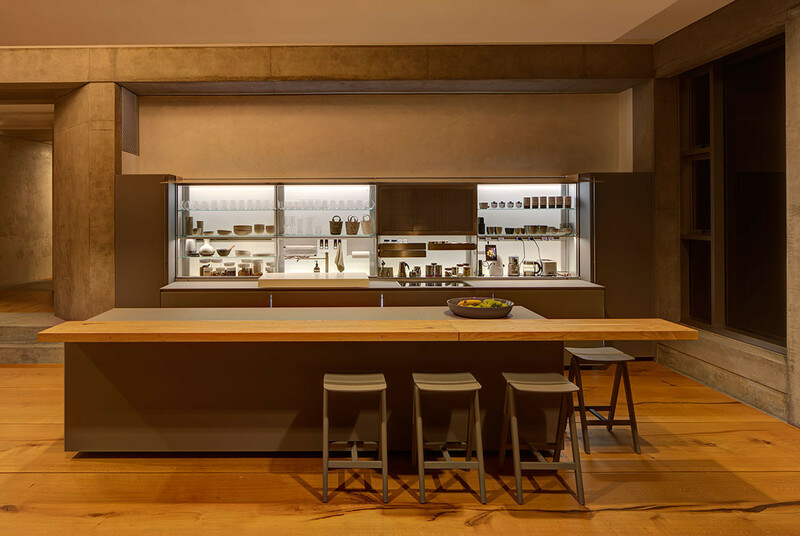 Valcucine New Logica kitchen joinery. Custom stainless steel, oak veneer and polyurethane joinery by Mark Watson, Trubuilt Leather handrails by Bound Interiors. Xilos table by Antonio Citterio for Maxalto; Eucalipto and Eracle storage units by Antonio Citterio for B&B Italia; Husk armchair by Patricia Urquiola for B&B Italia; Almora armchair by Nipa Doshi + Jonathan Levien for B&B Italia; Husk bed by Patricia Urquiola for B&B Italia; Alys bed by Gabriele & Oscar Buratti for B&B Italia; Fat-Fat ottomans and Lady-Fat side tables by Patricia Urquiola for B&B Italia; Eileen side table by Antonio Citterio for B&B Italia and Extrasoft Sofa by Piero Lissoni for Living Divani all from Space Furniture or Spotti Milan. HAY Copenhague stools from Cult. e15 Backenzahn stools from Living Edge. Ribs bench by DesignByThem. Stubb wool and linen rug by Kasthall from Spotti Milan. Gandia Blasco flat table and sun loungers from Hub Furniture. 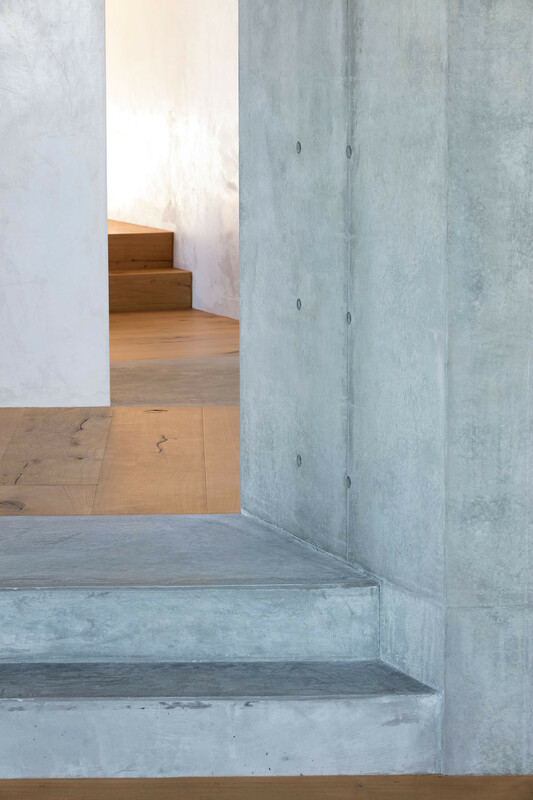 ERCO track lighting. FLOS USO and Teardrop ceiling lights. 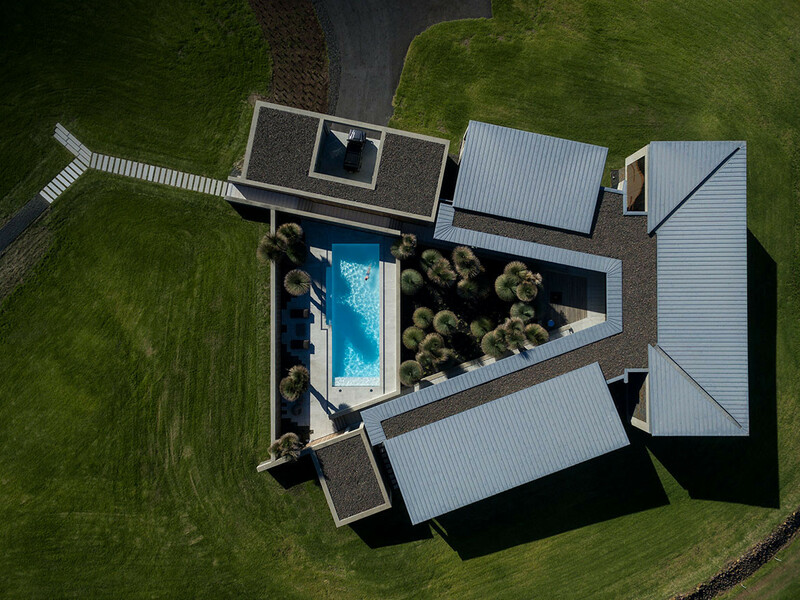 KKDC linear outdoor lighting. Tatou light by Patricia Urquiola for FLOS. 28d light by Bocci. Porcelain ware from Caroma and Rogerseller. Accessories from Agape. Basins from Agape and Falper. Aquatonica showers. D28 tapware. Effegibi steam/sauna. Sourced from Spotti Milan, Artedomus, Rogerseller and Disegno Casa.